SAVING MONEY can be so hard sometimes. Hard to save yet so easy to spend! Remember back when you were a child, or if you’re a parent, think of your own children – turning something that seems otherwise boring into a game is always a great way to motivate them, right? Yet even as adults, we are motivated by challenges or competitions, which is why savings challenges are an awesome way to motivate yourself to save money! With New Years right around the corner, saving money is often a resolution for many people but many don’t know where (or how) to start! The first thing I always recommend is creating a monthly budget. Check out my free budgeting course below to help you get started! Check out my Begin to Budget Bundle to help you create a budget you can actually stick to! I created this bundle based on the exact system we used to pay off $54,000 of debt in only 22 months! 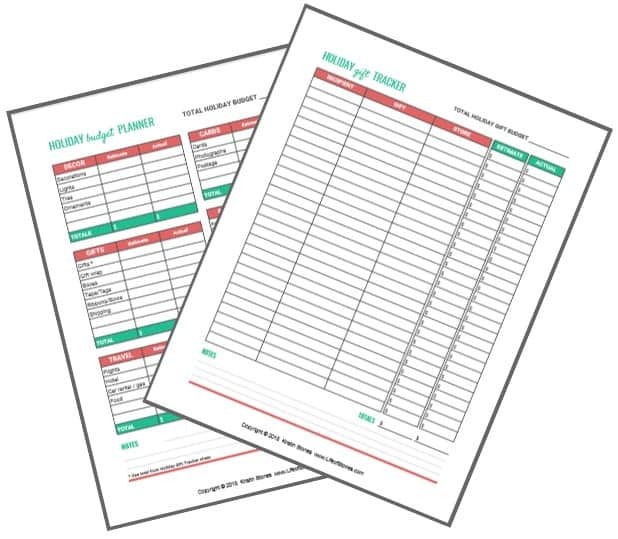 This 31-page printable budget binder will help you organize your finances, pay off debt and save money! 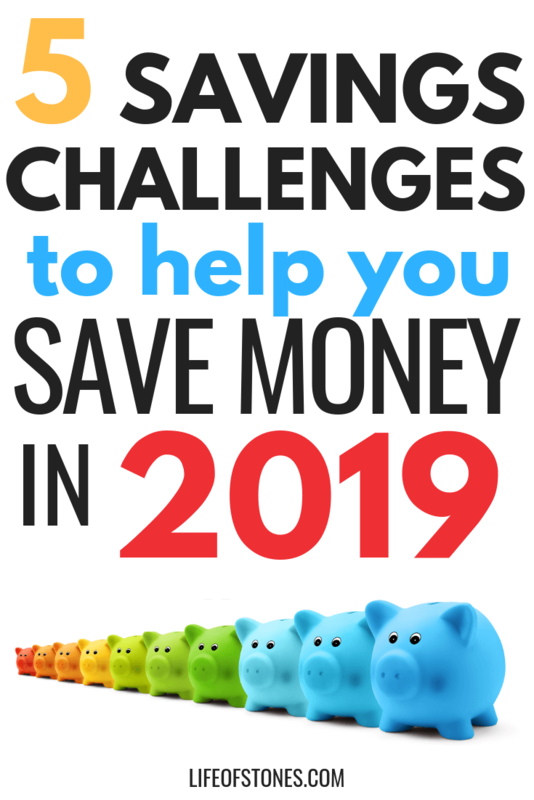 There are a ton of savings challenges around, in fact, you’ve probably heard of a few of them already and might not even realize it so I”m going to share a few of my favorites with you today in hopes of giving you a jump on your New Year’s resolutions! 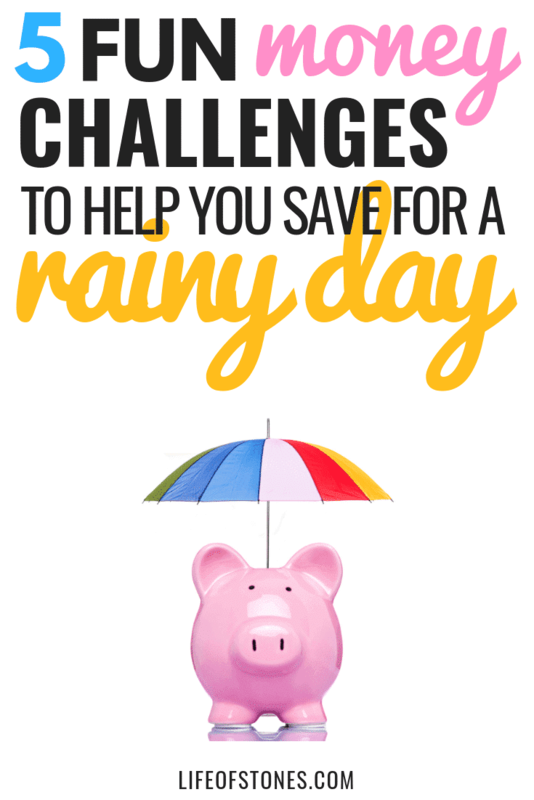 Here are five savings challenges that are perfect for the budding saver or a seasoned pro! 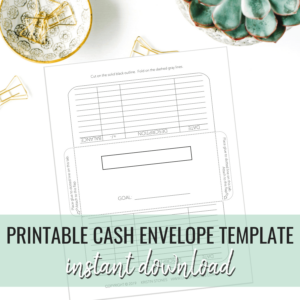 Plus, get access to printable savings challenge worksheets in my FREE Resource Library! This challenge is pretty self-explanatory and can be easily tailored to your preferences! Every time you receive a five dollar bill, you save it…easy peasy! This can be a five dollar bill you receive as a gift, as change from a purchase, or even cashing your paycheck. Any five dollar bill that passes through your hands, save! You can decide whether to save it by depositing it into a bank account or hiding it in your sock drawer, totally up to you! I will note that if you’re on a super tight budget, this challenge might not be the best place to start. Missing out on five dollars (sometimes more if you get multiples) could serve to put a decent dent in your disposable income each month. If you’re not quite ready for the five dollar bill savings challenge then give yourself permission to start smaller! Saving your one dollar bills each time you receive them would likely not affect your bottom line as much each week! Conversely, if you’re in a solid financial position and want to up the ante, you could save your ten dollar bills instead…that would definitely add up to some serious cash! I love this weekly savings challenge so much I printed this out and passed a copy around my office a few years back! This challenge such a helpful way to save a substantial chunk of money without affecting your budget in an extreme way! I also think this is a great method to save throughout the year and dedicate this money specifically for the holidays! You can use it for whatever you’d like, of course, but because many people struggle to afford the holidays this money challenge is the perfect solution to have a debt-free Christmas next year! The catch here is that the last quarter of the year you’re saving the bulk of the money for this challenge, which can be harder with the holidays quickly approaching! If this sounds a bit overwhelming to you, then #3 might be a better fit for you! This is technically the same challenge as number two but you’re going to flip the script and complete it backward or in reverse! This version is awesome because it allows you to get the big numbers out of the way early in the year and relieve your budget come year end and more importantly, the holiday season! Not only will you not be strapped trying to scrounge up extra money for the weekly savings at the peak of the Christmas shopping season, but you will also actually have saved up $1,378 at the end of the year for your holiday budget! Win-win! It’s likely you’re actually saving your spare change already so this challenge will be no sweat for you. But participating in this challenge with intention will probably help you find even more change to add to the pot! Find yourself a cool change jar or even an awesome bank like this! 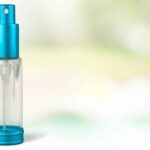 I bought myself one of these (my kids have them too!) and I absolutely love it! I’m a very visual person so It makes me happy to see that number go up each time I drop my coins in! Keep your jar or bank in a convenient place where you can drop your change right after you return home from making a purchase, that way you’ll be sure to save it and avoid tossing it in a junk drawer never to be seen again! This is an awesome challenge to try if you’re working to build up a starter emergency fund! An emergency fund of 3-6 months of living expenses is essential for a good financial foundation, but in order to build up savings of that size, it’s usually a good idea to pay off your debt so you have more money available to save each month! A starter emergency fund, however, is usually around $1,000 set aside for emergencies that pop up while you’re working to get your finances in order! This savings challenge is a great way to get your starter emergency fund in place in only 3 months! You can save this daily, weekly or monthly! Weekly would be $77/week, daily would be about $11/day or monthly would be $333/month! This challenge can feel a bit overwhelming as it’s a good amount of money in a shorter amount of time. But having a very specific end-game in mind, ie. funding your starter emergency fund can be an incredible motivator! Just think of how amazing it will feel to know that you have $1,000 big ones just sitting in an account waiting for an emergency to come around! The cool thing is that most – not all, of course – but most emergencies we incur can easily be covered by $1,000! A sick pet (or kid), a flat tire, a broken dishwasher….most of the annoying little things that pop up can be handled with your starter emergency fund so this challenge will really put you in a good position to start the new year! I know this sounds like a lot of money to save and you might now have enough extra to complete this challenge, but that’s why it’s called a challenge….because it’s challenging! Try to think outside the box with this one! A great way to cut costs is by meal planning each month! Find a side hustle you love to bring in some extra cash on the side like starting your own blog or switch to a cash budget system, which will help you keep better track of your money! Regardless of which savings challenge you decide to try (or go ahead and try them all) the point is that you are creating a habit of paying yourself first by saving consistently each day, week or month! Dave Ramsey always says that your income is your biggest wealth-building tool, but if neglecting to save a portion of your income can set you back years on your journey to financial freedom! Have you tried any of these fun savings challenges before?! 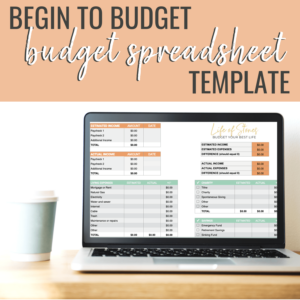 Don’t forget to check out my new Begin to Budget Bundle to help you get started budgeting today! Remember to grab your FREE savings challenge printables in my Resource Library below!